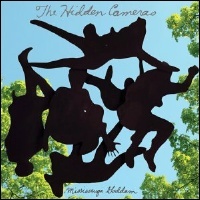 The Hidden Cameras hold the unique honour of being one of the bands whose live show differs so drastically from their recorded albums that, although they obviously share the same basic elements, they sound like they come from two very different creatures. In the right setting on the right night with the right set-list, Joel Gibb and his minions can captivate an audience like few other acts; a mixture of large, timeless melodies cradled by equally ambitious arrangements, all set to...a bunch of dancers, male strippers, and the fascinating clown-car set of personnel pulling it all off. Take a semi-recent show that I caught at the Toronto Dance Theatre, for instance. Ignoring a few ridiculous dance pieces that accompanied the set ("Golden Streams" nearly brought us to fits of laughter, though several -- like "Ban Marriage" and "Animals of Prey" -- worked considerably well), the Hidden Cameras worked through their material like they had been playing them for the first time. They also debuted a series of new tracks, including incredible versions of "B-Boy" and "In The Union of Wine," both of which had -- like the first time I'd heard "Golden Streams" and "Boys of Melody" live before the release of The Smell of Our Own -- made my expectations for their sophomore release, Mississauga Goddam, inconceivably high, even despite the fact that I had felt luke-warm on their only other two releases. See, when it comes to their records, the Hidden Cameras have just never grabbed me in any way close to their live show. The Smell of Our Own was adorned with a gorgeous production and impressive songwriting (the aforementioned "The Boys of Melody," "Ban Marriage" and "A Miracle," especially), but it still refused to really leach itself to me outside of a few songs at a time that would remind me of just how commanding their concerts had been. Gibb's voice sound noticeably tamed and given only a small percentage of the space it had consumed on stage, now partially swamped by the Phil Spector-via-the-Smiths production. Mississauga Goddam (for those not familiar with the Greater Toronto Area from which Gibb hails, Mississauga lays just outside of the city) comes just over a year later and, not surprisingly, still falls into the same problems. While "In the Union of Wine" turned around as infectious and power as its live counterpart, remaining one of Gibb's finest single cuts to date, "B-Boy" isn't as lucky. Though the Springsteen inspired hook still has a decent punch, the gargling snarl that he employs on the chorus hook can be as annoying as it is memorable. As for the rest of the new material, "Doot Doot Plot" opens the record with a '70s sitcom theme, and though its campiness is layered on awfully thick, its soaring chorus -- reminiscent of a good deal of Smell of Our Own's -- makes it a triumphant opener. "I Believe In The Good of Life," a remake of the Ecce Homo cut, sounds like Interpol finally deciding to pull off a chamber-pop masterpiece (admittedly, I mostly say this because of Gibb's mannerisms during the chorus), while "The Fear Is On" continues in the group's theme of mending Christmas carol melodies with a Smiths edge (I never thought I'd piece those two words next to each other), and in this case, one of the most upbeat tempos they've tackled. "That's When the Ceremony Starts" and "We Oh We" are also fine additions to the record, even if both -- like the aforementioned tracks -- sound incredibly similar to more than a few Hidden Cameras song that came before it. Which wouldn't be anything to complain about, really, if they'd made a full record as strong as those six tracks. But, to release a sophomore album that'd be exactly like their first, you'd have to add a fair amount of humourous (and not always in the good way) lyrics and at least a few throw-away songs that forfeit the accomplishments that surround them. This time around, we get "Music Is My Boyfriend" (which has been the name of their website for some time now), spinning a lovely downbeat melody around lyrics like: "Music filled my mug with vaseline/ I gave him a choke" and "I kissed his ugly, gangly greens/ He swallowed my pee." Like "I Want Another Enema" (which, musically, takes the group into a poppier direction, if you can believe it), it's not so much offensive or taboo as just distracting and superfluous for a group that are, otherwise, capable of writing some great pop music without the gimmick. Of course, this record was written and recorded in less than a year since their full length debut (which came shortly after Gibb's first four-track EP, Ecce Homo), so we shouldn't be expecting a massive departure or maturation from the group. But to revise a debut with only a slightly more effective result is nevertheless disappointing for all of their fans awaiting an album as moving as their live show. You got the style right the last time around, Joel, but why release two consecutive records with substance that only holds up for two-thirds of their run, instead of taking your time, using the humour more effectively and creating something worthy of the talent that's behind it.